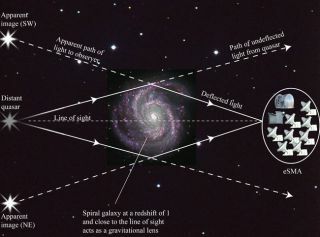 Illustration of gravitational lensing (not to scale). The light from the distant quasar is bent by the gravitational field of an intervening spiral galaxy placed fortuituously near the line of sight. The bending produces two artifact images of the quasar, which are observed by the eSMA. The spiral galaxy itself is located at large distances from the sun, corresponding to only 45% of the current age of the universe. A new giant virtualtelescope is the most powerful tool scientists have ever had to study theuniverse in a part of the electromagnetic spectrum called long wavelengthsubmillimeter light. The ExtendedSubmillimeter Array (eSMA) was created by combining three telescopes in Hawaii using computer software. By routing them together in a process called interferometry,the combined telescopes have the virtual resolution of one hugetelescope the size of the distance between them. In this case, the virtualtelescope has a diameter of 782 meters, or about half a mile. The eSMA is made up ofthe SubMillimeterArray, which contains eight dishes with 6-meter diameters, as well as the15-meter James Clerk Maxwell Telescope and the 10-meter Caltech SubmillimeterObservatory, all on the summit of Mauna Kea on the Big Island of Hawaii. Allthe dishes are linked via fiber optic cable to form an enormous virtualtelescope akin to the sum of its parts. "It would beimpossible to build a telescope this large, so we take several smallertelescopes," said Sandrine Bottinelli of France's Center for the Study ofRadiation in Space. "The radiation is collected by each antenna and thencombined by computer software. That allows us to simulate a signal that wouldbe equivalent to what we would get with a single large telescope." For now, eSMA is themost powerful submillimeterobservatory on the planet. Interferometry iscommonly used to string together radio telescopes. Making a submillimeterinterferometer is a bit trickier because of the weather conditions required forsubmillimeter astronomy. The water vapor in the Earth's atmosphere blockssubmillimeter radiation in most locations. "It's moredifficult to find a site," Bottinelli told SPACE.com. "Youneed a generally dry and stable atmosphere, so it must be high altitude." Mauna Kea's lofty location at 14,000 ft (4,000meters) is perfect. Scanning the universethrough submillimeter light allows astronomers to peer deep into the dustyregions in which new stars, planets and even whole galaxies are being born.These clouds of gas and tiny dust particles are completely dark in visiblelight, because optical wavelength light is absorbed by the gas and dust. Butsubmillimeter waves, which are longer than optical light waves, can penetratethis material. Recently Bottinelliled one of the first observations made with the newly-built eSMA. She pointedthe scope at a bright radio source located behind a foreground spiral galaxy,which is so far away its light left when the universe was only 20 percent ofits current age. The foreground galaxy acts like a lens, bending the light fromthe radio source and focusing it toward Earth. Since the bright object's lighttraveled through the galaxy on its way here, it revealed clues about theinterstellar gas in the spiral, including the presence of atomiccarbon there. Atomic carbon is significant because it plays an importantrole in building more complex organic molecules.